Home Care Sheets & Guides The Best Substrate for Goldfish: Gravel, Sand or Bare Bottom? The Best Substrate for Goldfish: Gravel, Sand or Bare Bottom? Aquarium substrate refers to whatever substance it is you choose to line the bottom of your tank. It not only substantially affects the overall look of your aquarium, it can also influence the chemistry of the water and the health and well-being of the fish in the tank. Therefore, choosing the right substrate is an important part of caring for your goldfish properly. Not surprisingly, with so many different types available, a very common question for the beginning aquarist is: What is the best substrate for Goldfish? Which of the Options is Best? Can Sand Irritate Goldfish Gills? Sand Stays Cleaner Than Gravel, But May Not Look It! Each have their pros and cons, so let’s take a look at each in detail, so you can make an informed decision. To answer this question, you have to ask yourself both how the substrate can affect your goldfish and what kind of aquarium experience you’re looking for. Do you want a tank that looks like a cross section of nature, or do you love bright colors and sunken castles in the background? There are a myriad of options out there, so we’ll just cover the three substrates most commonly used: gravel, sand, and bare bottom. We’ll go through the pros and cons of each, and give our recommendation of which to use and why at the end. Gravel is perhaps the most traditional and most commonly used substrate, reasonably cheap and readily available. When we think back to that childhood goldfish bowl, it likely had brightly colored pea sized gravel at the bottom. I know mine did! But is gravel really the best choice of material to use in your tank? If the gravel is too small, the fish can swallow it and potentially die. If the gravel is sharp or rough, the fish can damage their mouths. If the gravel is just barely small enough to get picked up, it can become lodged in the mouth. Then you will have to remove it manually, a process that is not fun for fish or for the owner. For these reasons, if using gravel (and I do!) I recommend using gravel no smaller than a pea. Keeping the gravel clean is another challenge. The larger the gravel, the more food and waste can fall between it. This will rot producing ammonia and nitrites, both of which are harmful to fish. To combat this the gravel should be vacuumed regularly, ideally with every weekly water change. This will prevent waste from building up and polluting the water. This is more work than bare bottom tank, but really, it’s not a lot of work at all so don’t be put off! On the plus side, gravel provides lots of surface area for beneficial bacteria to grow. Nitrifying bacteria eat the ammonia and nitrites, leaving behind far less harmful nitrates and hence improve the environment for your fish. The more surface areas in your tank, the more potential beneficial bacteria you will have. Gravel can also provide a place for plants to put down roots and grow in your tank. Now the challenge is convincing the goldfish to stop digging the plants up and eating them. If you choose to use gravel, make sure it is specifically intended for the aquarium. This will be inert rock that won’t leech any kind of nasty chemicals or pollutants into the water. Always rinse your gravel thoroughly before use so you don’t accidentally import a pest or contaminant to your tank. Sand is a relatively new choice in goldfish keeping. Funny, because this most closely resembles their natural habitats. The fish our goldies are descended from lived in slow-moving water with a muddy bottom. The perfect substrate would probably be dirt and mud, but that would give us a very murky tank. Not ideal for watching our beautiful fish! Sand is an excellent substitute for dirt. It will allow your fish to rummage around looking for food, but won’t muddy up the water. Many people hold the opinion that sand can irritate the gills of goldfish. No hard evidence has ever been shown that this is true, but it’s worth mentioning for the sake of fairness and clarity. In my opinion, it’s fine. Goldfish encounter this in the wild and they have thrived with sand substrate when I’ve chosen to use it. So in my opinion, it’s good to use…but you will find people who disagree. Sand won’t allow food and waste to fall through the cracks like gravel will. Any waste will sit on top of the sand, allowing it to get stirred back up and hopefully sucked into the filter. However this means you will see every bit of waste the fish leave behind, almost as much as with a bare bottom tank. One thing to consider with sand is that it can compact over time and this creates areas where oxygen cannot reach. Pockets of hydrogen sulfide can form in these anaerobic areas, which is a very toxic substance to fish and if a lot builds up and is released from the sand all in one go, can be a serious health risk. I’ve been known to get my hands down into the sand and stir it up to move any such gasses out into the water column. This also kicks up much of the waste that has gathered on the bottom of the tank, which will then get sucked into the hose during a water change. Please note that I only ever stir up the sand immediately before a water change. Cleaning the surface of a sand bottom can be challenging. It’s easy to vacuum up the waste, but difficult to not vacuum up some of the sand along with it, though it is possible with a very delicate hand and is something you get better at with practice, hovering at just the right height. If some sand ends up in the bottom of your water bucket, simply give it a quick rinse and toss it back into the tank. Simple. Please be aware that sand scratches glass easily. If you use a magnetic algae scraper, it’s very easy to get a grain of sand stuck in the scraper and leave a nice long scratch on the front of your tank. I have marred a few tanks this way, even when being very careful. This very problem has led me to avoid the magnetic scrapers. In fact, of all the anti-algae tools I’ve tried, an old credit card still seems to be the best. As with any substrate, be sure to give your sand a thorough rinsing before putting it in your tank. This will remove any unwanted surprises, as well as keep the water from getting cloudy at the outset. Note: You can check out this guide if you’d like more info on the best aquarium sands available today. Bare bottom tanks are the most Spartan and utilitarian form of fishkeeping, definitely placing practicality over looks. But is it a good choice? Many goldfish breeders will tell you they only ever use bare bottom tanks as they are easy to keep clean and are very low maintenance. But also because if breeding rare and expensive goldfish, they do not want to chance there being something unknown lurking in their substrate. I.e. harmful bacteria or parasites. Also, it’s not unknown for goldfish to harm themselves on gravel or sand. Yes, the chances are slim, but it’s not unknown and with a bare bottom tank the chances are lowered to zero. Sometimes with a particularly rare fish, every precaution is taken. Leaving the bottom bare also gives an extra inch or two of water column and with a fish as dirty as goldies, every little bit of water space helps, diluting concentrations of waste and truly maximizing the availability of space. With a bare bottom tank you will find algae growth on the bottom becomes so much more highly visible, with some people thinking it makes the tank look dirty. But if you don’t mind the look of algae, its presence can actually be beneficial. But if you’d rather it gone, it can very easily be scraped off the bottom of your tank with an old credit or store card, or a purpose bought tool costing just a couple of dollars. It has to be said that the waste your fish produce is highly visible on the bottom of the tank too and can look unappealing and messy. But to siphon it out is so much easier when it’s not caught between bits of gravel! Goldfish are busy, active fish whose natural behavior is to continuously explore and forage. They’re happiest when they can root around in the substrate looking for bits of food they missed. Having a bare bottom tank doesn’t allow this natural urge to be exercised. Not only this, some aquarists think the reflective bottom can cause stress as well. When was the last time you saw a river or lake with a mirror for a bottom? It’s unnatural and there’s suspicion they get spooked and stressed seeing their reflections, thinking it’s other fish. But they also lose perspective on where the floor of their environment is. If you wish to keep live plants with your goldfish, you will have to keep them potted in the tank as there will be nothing in the bottom of the tank to root them in, likely restricting growth and limiting the choice of plants you’ll have. However, you can choose non-rooting, floating plants, like anubias and java fern. I’ve seen some very attractive bare bottom tanks arranged with live plants and driftwood. Just be aware that those plants may very well become lunch – and if interested, check out our guide on how to find and prepare driftwood! There are a number of other substrates in use, all with their own pros and cons. I’ll save most of these for another article but have a few more words to say below. Many of the ones that are best for plants aren’t goldfish friendly. Eco-Complete is a wonderful medium for rooted plants, but is composed of very sharp and jagged pebbles that will hurt your goldfish. Take a good hard look at any substrate to make sure it won’t damage a digging fish. Amazonia Aquasoil is a popular substrate for the high-end aquascaper. It’s fired clay from Japan. Excellent for plants, but very expensive. It will eventually turn to mud, especially with a few large goldfish moving it around. 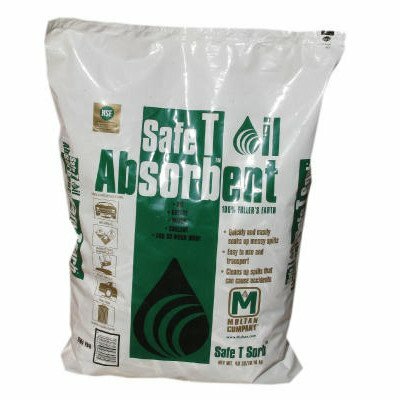 I have used Safe-T-Sorb in several of my tanks in the past. It’s a clay mix like Aquasoil, but it’s far cheaper. It’s not actually sold as an aquarium substrate, it’s used in industrial settings to clean up oil spills, much like old kitty liter. When it’s fresh out of the bag it’s simply clay, and I’ve had great success with it and zero problems. Keep in mind that when you first use it you will need to rinse the clay over and over and over again, and then you’ll still get a muddy mess in the tank for the first week or so. Once it settles down it’s great, and it’s very gentle on my fish. But I’m hesitant to go through that process again, I can’t stand a murky looking tank! We’ve looked at three substrates now, and hopefully you have a good idea of which one appeals to you. To sum up, let’s reiterate the pros and cons. Gravel substrate looks good, is easy to clean, is good for live plants and allows your fish to forage. Just make sure the gravel has no sharp edges and is no smaller than the size of a pea. Sand substrate looks very good, gives goldfish foraging possibilities and provides huge surface area for good bacteria. However, it’s harder to keep clean, can trap and build up harmful gases, can possibly irritate gills and will lead to scratches in your tank. Bare bottom tanks are easy to maintain, have nothing for fish to harm themselves on and provide for the most amount of water in a given tank. However, IMO they look kind of dull and completely remove the chance for goldfish to exhibit the natural behavior of foraging. At the end of the day, every aquarist will have their own opinions and advice for you. There isn’t always a right or wrong answer, just differing views on the same subject. For the beginning aquarist, gravel is certainly the easiest to get right while providing a goldfish with a healthy environment. Always remember that we learn through trial and error. If you find a method that works for you, run with it. Finding your own way is half the fun of the hobby. What about the half marbles? They’re usually a blue color and made of glass? I don’t think they’re sharp, small enough to get stuck in a fish’s mouth, leech chemicals into the water, or let waste fall between the cracks and not be easily foraged through? They would be fine, for sure, though they do prefer gravel or sand because the half marbles are so large they can be hard to move around and forage in. I’ve been collecting sea glass for years and it would look awesome in an aquarium. None of it is sharp or small. Is there any reason not to use this as a substrate for goldfish ? It can be OK to use, sure. My only worry would actually be if the glass pieces were too large, with too large a gap between pieces, that a betta could potentially get stuck between. Other than this, no worries at all. If properly cleaned, the glass is inert, will not affect water quality, and if not sharp then there’s little to worry about. I think my fish has a gravel stuck in his mouth! How do I safely remove it? After I’d removed it, all was well afterwards. Just try to make sure you position the stone in such a way that you have to stretch the fishes mouth the least possible when removing. Best of luck! Do Goldfish Need an Air Pump? Do Bubbles Help Them Breathe? Goldfish Water Temperature Guide – What is the Range for Goldfish?